Vibrantly packaged, this exotic collection features some of Fushi`s most exciting oils for skin, hair and beauty from all over the world. Pure, freshly cold pressed and unrefined, each oil offers its very own unique skin or hair benefits. Included in this sumptuous gift set, is the Polynesian tamanu oil, famous for its skin healing attributes, often called the ‘oil of the Gods’, tamanu is becoming increasingly popular as a beauty oil. There is the African moringa oil renowned for its immense age fighting properties and its unique healing values. The tropical passion fruit seed oil for its delicate fragrance and nourishing qualities, perfect as a body oil. From the desert lands comes the exquisite pomegranate oil with its wealth of skin nutrition. Not forgetting Asia, the Japanese camellia oil, for its fabulous moisturising qualities, and lastly the Brazilian buriti oil for its amazing skin and hair benefits, often called the Amazon’s beauty oil. It is an exotic and indulgent collection of oils to enjoy and experiment with, and at the same time reap the amazing abundance of benefits that oils offer for beauty. 100% Organic Camellia Oil (Camellia Japonica), Cold Pressed, Unrefined. 100% Organic Pomegranate Seed Oil (Punica Granatum), Cold Pressed, Unrefined. 100% Passion Seed Oil (Maracuja) (Passiflora Edulis), Cold Pressed, Unrefined. 100% Organic Tamanu Oil (Calophyllum Inophyllum), Cold Pressed, Unrefined. 100% Organic Brazilian Buriti Oil (Mauritia Flexuosa), Cold Pressed, Unrefined. 100% Wild Crafted Moringa Oil (Moringa Oleifera), Cold Pressed, Unrefined. Stretch marks: Nourish the skin by massaging a few drops into the affected area daily. Soften the locks: Use as a leave-in conditioner by applying a few drops into damp hair, especially the ends. Face moisturiser: Lightly hydrating oil for all skin types. Apply a few drops daily to the face. Sun damage care: Apply a few drops on the affected area twice daily to help support healthy skin. Face moisturiser: Nourish the face by applying a few drops to the face or use overnight as a night oil treatment. Dry skin: Tackle dry skin by applying generously to dry areas such as elbows, knees and heels. Face moisturiser: Beautifully hydrating for all skin types. Apply a few drops daily to the face, or use overnight as a night oil treatment. Dry hands & brittle nails: For healthier and smoother cuticles add one or two drops to a cotton pad and apply on nails and cuticles. Skin healing: Naturally antibacterial. Apply a few drops to help heal blemish prone areas. Face moisturiser: Intensive hydration. Apply a few drops daily to the face, or use overnight as a night oil treatment. Scarring: Naturally regenerating. Apply a few drops to the affected area twice daily. Hair conditioning: Deeply conditioning for dry/damaged hair. Massage a few drops into the scalp and leave overnight before washing. Face moisturiser: Anti-ageing oil, especially good for mature skin. Apply a few drops daily to the face, or use overnight as a night oil treatment. Anti-ageing: Rejuvenates ageing skin. Apply a few drops daily as a moisturiser. Skin healing: Naturally antibacterial. Apply a few drops to heal minor skin abrasions and to help treat blemish prone areas. Stretch marks and pigmentation: Naturally boosts skin repair. Apply a few drops to the affected area twice daily. If you suffer from skin condition or allergies, make sure you do a patch test first. 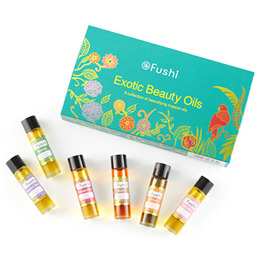 Below are reviews of Fushi Exotic Beauty Oils Gift Set by bodykind customers. If you have tried this product we'd love to hear what you think so please leave a review.